Early work equipment required extra reach and a safe, reliable way to elevate workers and job material. Innovative engineers and inventors soon came up with a prototype for the aerial cherry picker. Today’s aerial cherry pickers resemble their early “ancestors,” although the present-day equipment far exceeds anything the original designers would’ve fathomed. If you operate aerial lifts or aerial cherry pickers for a living, or if you’re looking to get into the industry, knowing how the equipment came to be isn’t just helpful – it’s actually way more interesting than you’d think! Regardless of how aerial cherry pickers keep evolving, CertifyMeOnline.net will continue to offer the best OSHA compliant training around. With our affordably priced courses, lifetime support and insider OSHA expertise you need, we’re the perfect training partner for small, medium and large companies. If your company has training gaps with your aerial cherry pickers and other aerial work platforms (AWPs), contact us today! The first aerial lift actually wasn’t an aerial lift. In the early 20th century, when the agricultural boom was happening all over America (the Dust Bowl era of the 30s notwithstanding), devices called cherry pickers were used to elevate fruit harvesters high above the ground, with the idea of getting a better overall crop yield. From there, typical ingenuity and innovation kicked in. By mid-century, the first aerial lifts and aerial cherry pickers were widely in use. And not just for orange groves and other similar environments – they were used for accessing anything from power lines to upper-floor windows to bridge spans. The aerial lift had truly arrived. Soon, aerial cherry pickers were used for much more than harvesting cherries (more on that in a minute). From construction projects to installation projects, aerial cherry pickers became an indispensable part of the American workplace. And they became bigger and frankly badder, too! 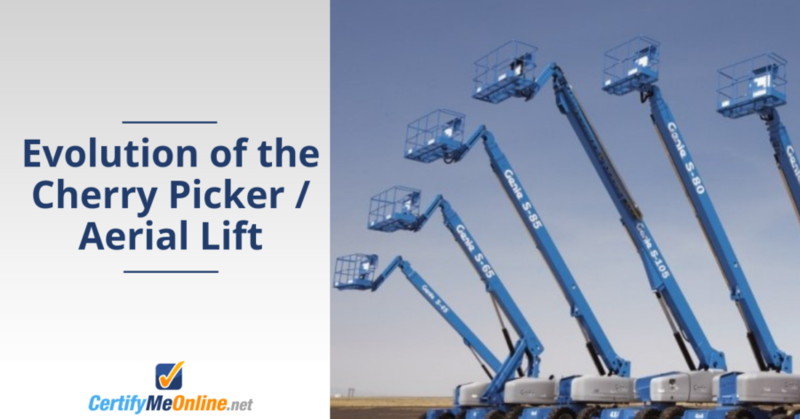 While the first aerial cherry pickers and AWPs reached only 20-30 feet up, today’s telescopic boom lifts and other large aerial cherry pickers routinely reach more than 100 feet! This expanded range and vertical reach is just one way the cherry picker evolved and continued to improve. Other enhancements (including reliability, safety and better overall performance) soon made aerial cherry pickers some of the most reliable, must-have industrial work equipment. Just by following the product history of a company like JLG, it’s easy to see how seemingly small advancements – oscillating axles in the 80s, fuel-cell powered aerial lifts in the 90s and the first 150-foot lift just a few years ago – culminated in the sleek, dependable aerial lifts on the market today. Why Are Cherry Pickers Called Cherry Pickers? Some of the first AWPs were dubbed “cherry pickers” due to their ultimate function – at least for orchard owners and farmers. The first aerial lifts were sometimes called cherry pickers because farmers, seasonal workers and others used AWPs to pick and harvest fruit, including cherries. Today, most AWPs aren’t used exclusively to pick cherries. As agriculture and harvesting has become less a staple of daily American life, aerial cherry pickers are just as likely to be used for construction, maintenance or even surveillance than picking cherries! But, the name stuck – and it’s not going away anytime soon. What does the future have in store for the aerial lift? We can’t wait to find out! The history of the aerial lift is certainly interesting. And it’s hard to believe, but safety standards were just as “primitive” as the aerial lift itself back in the day. But since the Occupational Safety and Health Administration (OSHA) was created, workplace safety standards are more regularly enforced. And you can’t “enforce” something without fines, penalties and legal action. That’s just what will happen (and maybe worse) if your company slacks in the safety department. CertifyMeOnline.net offers practical, universal pass-rate training material for your entire fleet of AWP, aerial lift and scissor lift workers. We’re a preferred training partner for thousands of companies and individuals across the country. With affordable rates, effective & proven learning methods and lifetime support, why would you go anywhere else for aerial lift and fall protection training? To get started today, please visit the CertifyMeOnline.net contact page, or call our aerial lift OSHA consultants at (602) 277-0615. Thanks for reading the CertifyMeOnline.net blog!